You will find a number of additional variants of European Blackjack on offer at some online casino sites, namely those which are powered by Microgaming software, whilst the base game of those variants is the European Blackjack game, a range of additional bonus side bet options are on offer. 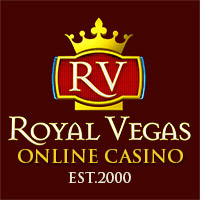 One such game is the Perfect Pairs Blackjack game and when playing this game online you will have the option of placing, alongside the base game bet something known as a Perfect Pairs side bet and by placing that bet you could win yourself one of three different bonus winning payouts, irrespective of whether your base hand wins or loses. We shall take a look at those side bet payouts in the next section of this review of the Perfect Pairs Blackjack game, however when playing off any base game there are just two decks in play in the shoe and those decks will always be shuffled before a new hand is dealt out to you. The dealer will play his hand until he has a hand worth 17 in value, that could be a soft or 17 hand but as soon as his hand is worth 17 or higher in value he will always stand it. This is not a hole card game and as such when the initial deal is being made only one face up card is going to be dealt out to the dealer. You are going to be able to place a base game bet from as little as 1.00 per hand up to a maximum of 200.00 per hand when playing the Perfect Pairs Blackjack game and by placing the side bet option alongside that base game bet you have the chance of winning three different payouts. If your first two cards dealt out to your hand are a mixed pair a payout worth 5 to 2 is paid out to you on that bonus side bet wager. By dealing dealt two initial cards which are a pair in the same colour the bonus payout is worth 15 to 1, and if both of your cards are in a matching pair then payout is a much larger 30 to 1 on your bonus bet staked amount. The other standard winning payouts are awarded on your base game hand which includes a 2 to 1 winning payout for a winning insurance bet, even money on all winning players’ hands or a 3 to 2 winning payout on all players winning blackjack hands. The Perfect Pairs Blackjack games side bet does increase the house edge of this game, however by playing the base game alone with perfect playing strategy that house edge becomes just 0.42%. As there are no additional cards needed for the side bet wager as the outcome of that side bet wager is determined by your initial two cards, the dealer is going to play the game in the standard way, namely dealing you out two initial cards and one up facing card to his hand. As soon as those cards have been dealt out if your hand is worth a card 9, 10 or 11 then you will have the option of doubling down that hand, which will cost you an additional wager equal to your initial hand in exchange for one more card to be dealt out to that hand. Players are going to be able to split their hand when allowed but players can only split it once, the cards which can be split are any pair of cards but unalike 10 valued cards cannot split. Any ace and 10 valued hands that are formed after a split is not a blackjack hand but if a winning hand it is paid out at odds of even money. We are now going to pass onto you a few little playing hints and tips for playing off the base game on the Perfect Pairs Blackjack game, for a much deeper insight into how to play off every single hand please refer to the blackjack strategy card displayed on this web page. Surrender – Unlike the Atlantic City Blackjack game variant and the Big Five Blackjack game variant you are not given the option of being able to surrender your hand at any time when playing Perfect Pairs Blackjack online. Doubling Down – If you have been dealt out a pair of five cards or a hard 10 or 11 valued hand when the dealer is showing a 2 to 9 valued card and also double down a hard 9 valued hand when the dealer has on show a 2 to 6 valued card then the prefect playing strategy will see you doubling down those hands. Hitting a Hand – Should you be dealt out two cards which are worth 5 to 8 or a soft 13 to soft 17 valued hands then always hit those hands. When to Stand – If on the other hand you have been dealt out a soft 19 or a soft 20 valued hand then perfect playing strategy will call for you to stand those types of hands. 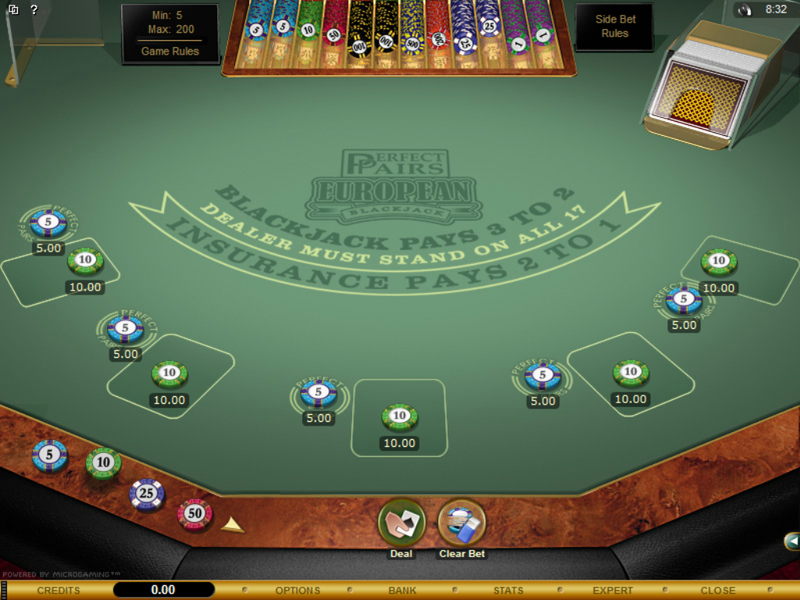 Insurance – As the insurance side bet options available on the Perfect Pairs Blackjack game is so very high you are strongly advised never to place that side bet wager at any time when playing this blackjack game online. As soon as you join up to any Microgaming software powered online casino site and choose to play the Perfect Pairs Blackjack game all real money action you give it will earn you comp or loyalty points. But be aware that bonuses which you have claimed from such a site often come with higher than usual play through requirements if you choose to play this game with bonus funds, so check the rules of the bonuses you are thinking of taking or have taken to ensure you can first and foremost playing this game with a bonus and secondly to discover just how much play through is required when playing this game.